Independent developer Michael L. Farrell has created Verto Studio 3D 2.0.1 for iPad, a massive update to his mobile 3D modeling app. Rivaling 3D software designed to run on desktop and notebook computers, Verto Studio 3D is a powerful and feature-rich app that combines sophisticated 3D modeling with an easy-to-use user interface. 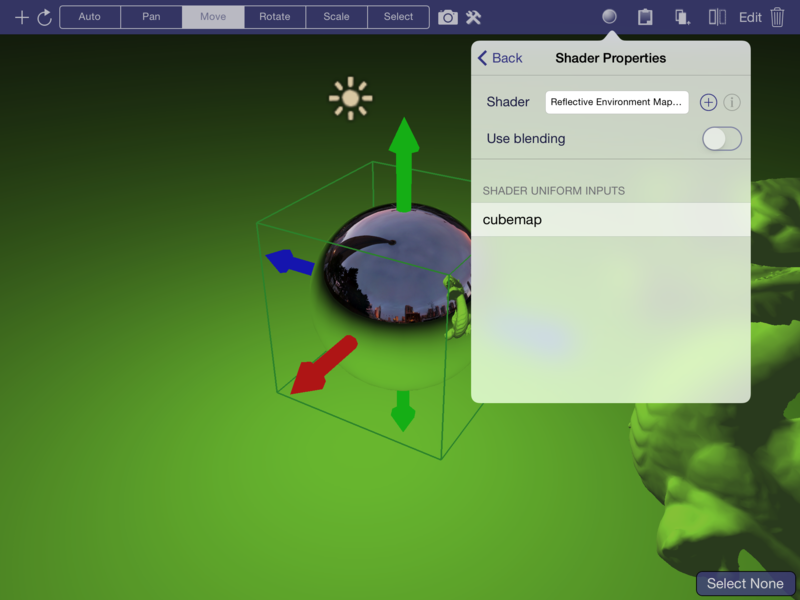 Version 2.0.1 boasts a new cutting-edge shader engine, including user-editable custom shaders that allow professional game developers to create professional-grade renderings, shaders, and 3D artwork. Verto Studio 3D is an application that's ballsy enough for pros and simple enough for neophyte modelers ... The Coolest Thing besides being built for iPad and results comparable to full-on desktop CG results? This app's got only 15 buttons. THAT'S a shallow learning curve for most anybody. 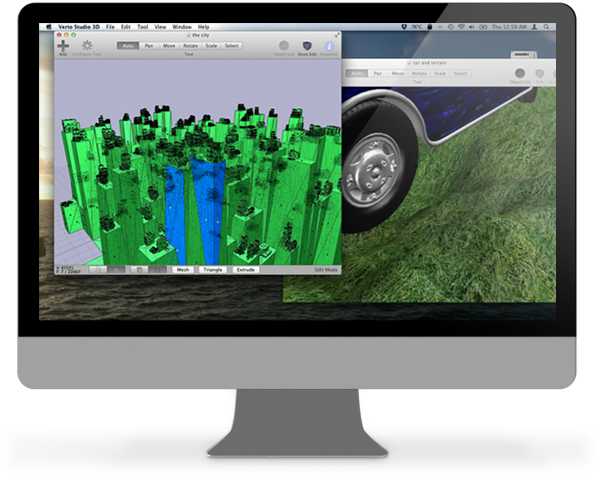 Verto Studio 3D includes a vast array of tools and features to create compelling and computationally intensive 3D models. Powerful enough for professionals and simple enough for beginning modelers, Verto Studio 3D is fully customizable in real-time. Most operations in the app are supported through gestures performed within the auto tool, however the majority of tools can be configured for precise translation, rotation, viewing, and scaling. With the most advanced editable graphics system on iOS, version 2.0.1 has a completely overhauled graphics system to support a more versatile mechanism of 3D rendering known as shaders. The shader system in Verto Studio 3D allows efficient and flexible processing of the vertex and polygon data of a mesh. This creates very interesting and sometimes more realistic 3D renderings in real-time that are far more powerful than the original "default" shader, which performs basic lighting and texturing. The update has incorporated a whole host of new built-in shaders including pixel-perfect lighting (phong), bump mapping, toon shading, reflective environment mapping, refractive environment mapping, multitexture, and BRDF. Additionally, Verto Studio 3D now features all-in-one capability of both modeling and shader development, including a built-in GLSL shader-editor that allows game developers to write their own shaders directly in the app. Without the use of post-processing, it is usually very difficult to obtain realistic renderings in just a single rendering pass. For this reason, Verto Studio 2.0 has added the ability to do post-processing through the introduction of the Verto Studio Post-FX system and the Render Pipeline Editor. This new WYSIWG render pipeline editor for multipass and post-processing effects includes built-in blending operators (i.e. add, subtract, multiply, divide, screen, overlay, blur). As a result, users can see every step of the rendering pipeline that the scene follows during rendering, and fundamentally change it to obtain powerful post-processing effects. ìDesigned with careful precision for all ranges of users, Verto Studio 3D 2.0.1 helps you think and create in 3D," says independent developer Michael Farrell. "You can use it to build quick 3D mockups or fully functional environments for mobile applications. Completely customizable, Verto Studio bridges the gap between design and mobile testing. Apple was so impressed with Verto Studio 3D for the iPad that they featured it in one of its TV commercials! The update is a massive graphical overhaul with new shaders and features." Farrell adds, "The way we work on a tablet is changing, and I thought this change deserved a new kind of app." San Diego, California - Located in beautiful San Diego, California, Michael L. Farrell is an independent developer with over eight years experience developing games on the Mac platform. His main focus is developing up to date, educational software tools for the iPhone and iPad platforms. Copyright (C) 2014 Michael L Farrell. All Rights Reserved. Apple, the Apple logo and iPad are registered trademarks of Apple Inc. in the U.S. and/or other countries.